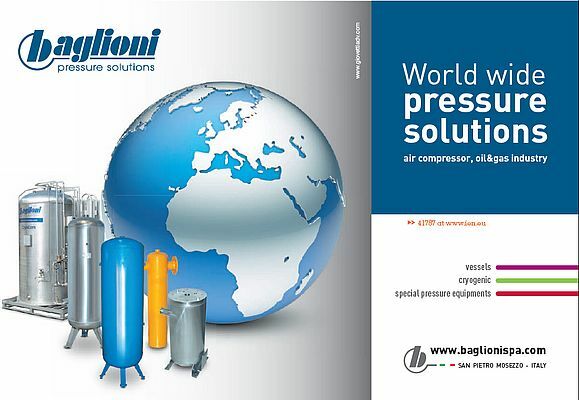 Gruppo Baglioni's products are aimed at the compressed air market and the oil&gas industry. Production includes vessels with 5 to 10,000l capacity, made of carbon or stainless steel; and innovative solutions for the treatment of process gases. Pressure solutions are Baglioni's mission, evolved from a structured and efficient industrial organization. They offer their clients a vast range of integrated services, designs, production and logistics in order to provide continuous collaboration. Baglioni Group's mission focuses on "Pressure Solutions". They continuously develop package solutions for the compressed air sector. The range meets requirements of all types, with customized supply of single products or whole assemblies.